1 Karte : Kupferdruck ; 55 x 82 cm Bellin s.n. 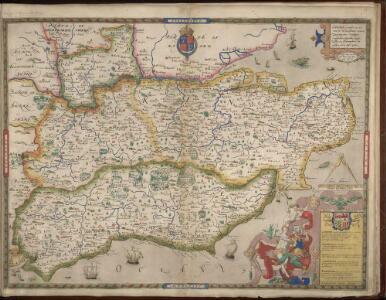 Description: This map of Kent and the neighbouring counties of Sussex, Middlesex and Surrey is from the 1583 edition of the Saxton atlas of England and Wales. This atlas was first published as a whole in 1579. It consists of 35 coloured maps depicting the counties of England and Wales. The atlas is of great significance to British cartography as it set a standard of cartographic representation in Britain and the maps remained the basis for English county mapping, with few exceptions, until after 1750. During the reign of Elizabeth I map use became more common, with many government matters referring to increasingly accurate maps with consistent scales and symbols, made possible by advances in surveying techniques. Illustrating the increasing used of maps in government matters, Lord Burghley, Elizabeth I’s Secretary of State, who had been determined to have England and Wales mapped in detail from the 1550s, selected the cartographer Christopher Saxton to produce a detailed and consistent survey of the country. The financier of the project was Thomas Seckford Master of Requests at the Court of Elizabeth I, whose arms appear, along with the royal crest, on each map. In the bottom right corner a scale bar and a written description of the counties and of London. Although at a small scale London is shown in some detail in the map with St Paul’s Cathedral and London bridge clearly discernable. St Paul’s is correctly shown without its steeple which was destroyed by lightning in 1561 and was not replaced. Paddington Highgate and Camberwell are shown as outlying countryside, as yet un colonised by the metropolis. In neighbouring Berkshire Windsor is marked by a larger group of red structures than its neighbours, reflecting the royal association with Windsor and the presence of the castle, the park is also shown as a large wooded enclosure. Hampton Court is also marked. The name of the engraver Remigius Hogenberg, one of seven English and Flemish engravers employed to produced the copper plates for the atlas, is contained in the scale bar.